None - Unless you want to leave the tank unattended whilst it drains and are worried about forgetting and completely emptying it. The intake is at a certain level so the syphon breaks once reaching that point and stops. You will have to raise the inlet to prevent draining too much water and it will involve adding a T-piece to the outlet of the canister and if you accidentally let it run dry, you end up damaging the motor. Uhh... I'm just talking about the U shaped pipe that is used as the canister intake. It already has a filter basket on the intake and can slip onto a garden hose at the other end. But where is the DIY fun in that? Crawls back into the man cave. That is indeed a great idea if you have another canister intake intake lying around. I am not convinced that the canister intake will fit the end of my hose which is a cheapo and fairly stiff. The U pipe is also not symmetrical. One end is longer than the other which means 2 different water depths. Just gotta change the basket and hose around. ... and you have the nerve to call yourselves lazy... lol. Just a quick update on the original design. I have left it outside in the full sun for months. No leaks or issues. For a typical quick water change, there is not a drop of water on the floor. Yeah okay, I just put the Garden hose onto my siphon and put it out the window, then hook the garden hose on top the tap and take the siphon off and she's done. Just thought l would post a picture of my newly designed and built water changer, went with basic idea as others but with a few changes. 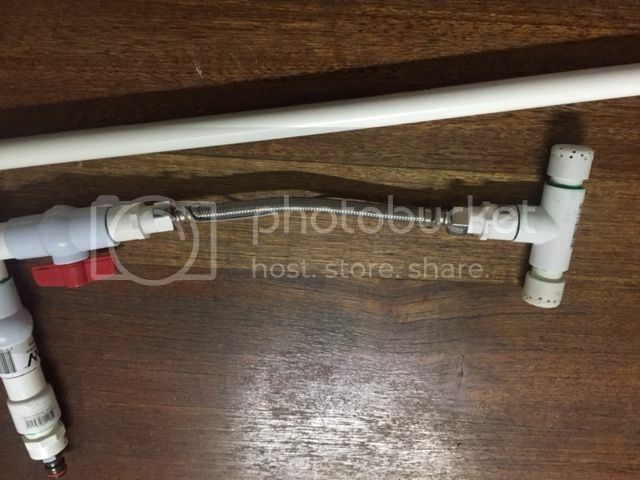 Change 2, Used a toilet plumbing flexible pipe, to this l attached a coat hanger wire, by bending the wire l can adjust the drain level of water. l have 3 tanks at varying heights so this was a crucial change. 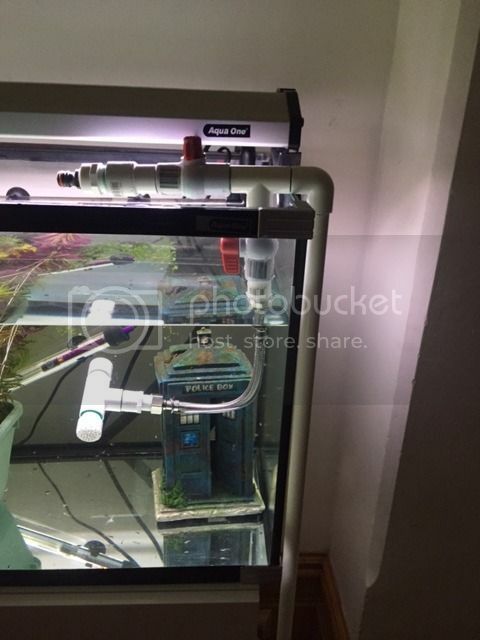 As l have used high pressure pipes and glue, l prime the unit in the bathroom and then take to first tank and start the process. l saved about 30min compared to my normal mixed approach of buckets and hoses, plus the wife was happy with no water on the floor. Nice. I would have added a T right where it bends down with a cap so that I can pour water into it to prime and also an inline ballvalve tap at the bottom. 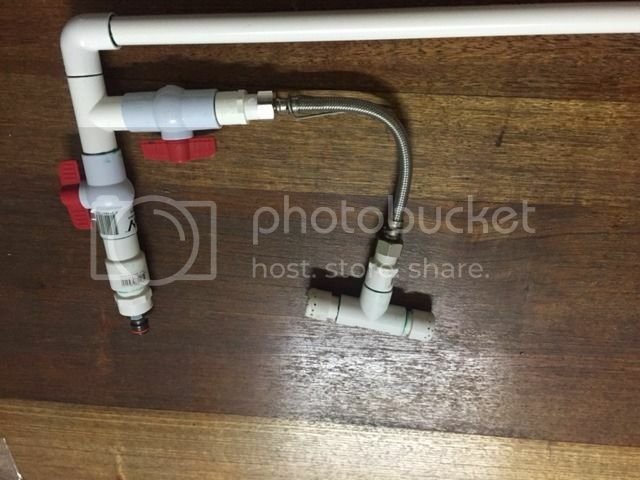 The way I prime mine is to close the bottom valve and open the top valve and cap and pour a cup of water and then close the top valve and cap and open the bottom valve and away the water runs. Has anyone made one of these recently? Any new tips or tricks? 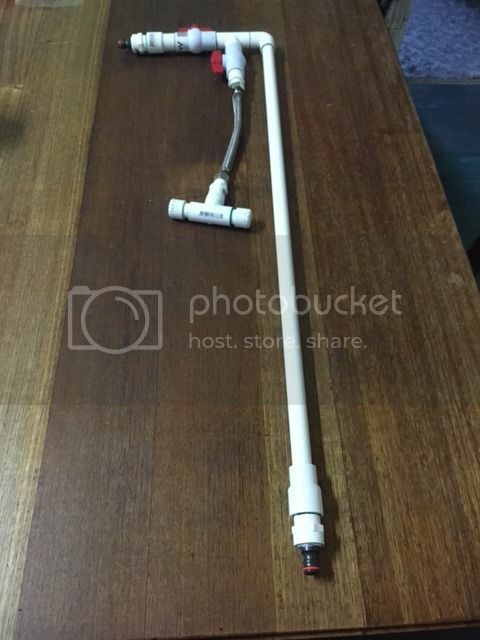 I'm going to have a go at one this weekend and include an extra inlet for a gravel cleaner. Just make sure you have a ball valve for each inlet. Show us your mods please. I am keen to see what you can do with it. My original lazylife is still going. I store it outside because of space constraints. Most of the time it's in the sun/frost etc and it has held up unbelievably well! !